January 1, 2013, 11:38 AM · Happy New Year 2013 from Pasadena! We're sitting at the corner of Orange Grove and Pasadena boulevards on New Year's morning, watching the 124th annual Rose Parade, which includes this year's float from the Disneyland Resort -- a 125-foot-long floral recreation of Cars Land at Disney California Adventure (and, if rumors prove true, coming soon to Disney's Hollywood Studios in Florida -- we'll just ignore the existence of the severely abridged version at the Walt Disney Studios in Paris). But since it's a theme park ride, something has to go terribly wrong. 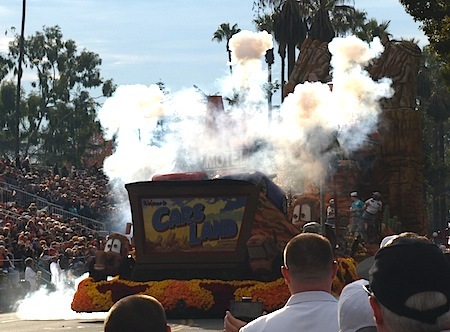 In a flash of fireworks, the float "breaks down." 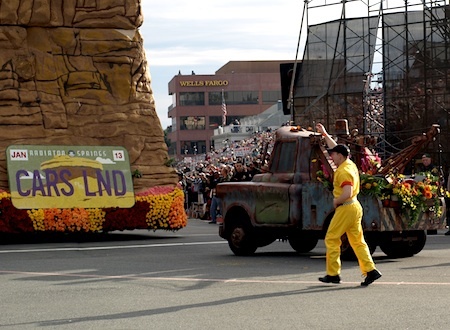 Fortunately, Cars Land is home to a certain tow truck, who drives up to give the float a jump, and save the day. Here's Sally, from the other side. 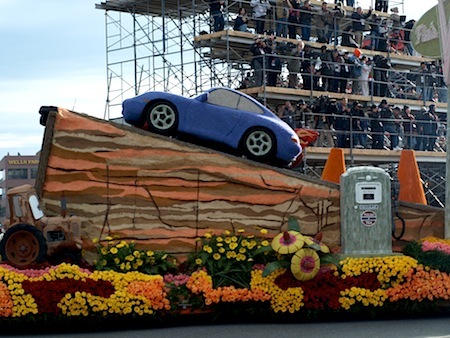 It's flowers depicting car parts depicting flowers! 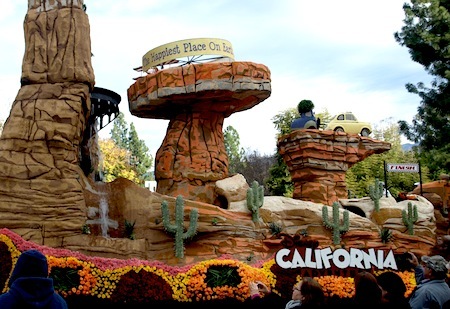 Radiator Springs Racers brings up the rear of the float. The only thing missing? The two-hour-plus queue of visitors, of course. 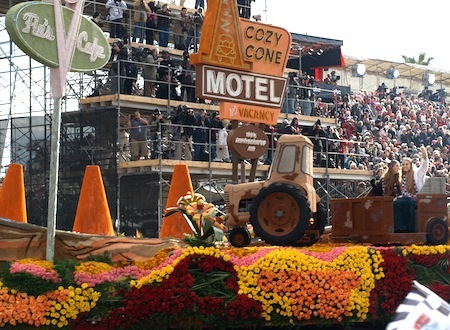 Here's another view of the entire float. Click for a larger view. And Mater and friend, bringing up the rear. 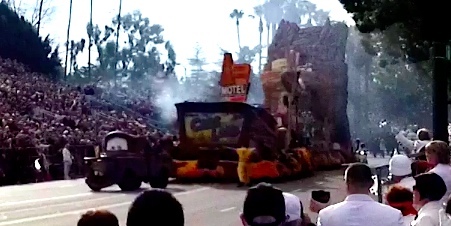 Here's a video of the float going by - I was sitting in the "TV bleachers" located across the street from the TV cameras at turn on the corner of Colorado and Orange Grove boulevards. Unfortunately, the sun came out just as the Cars Land float approached, so I was shooting into the sun. 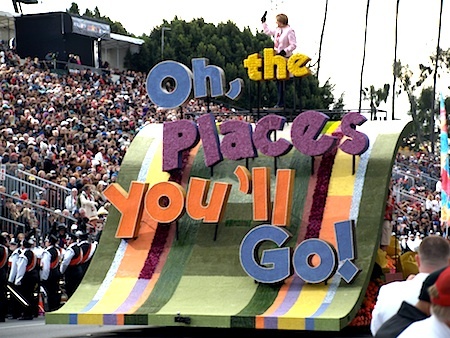 This year's Rose Parade theme was "Oh, the Places You'll Go." Happy New Year, theme park fans! 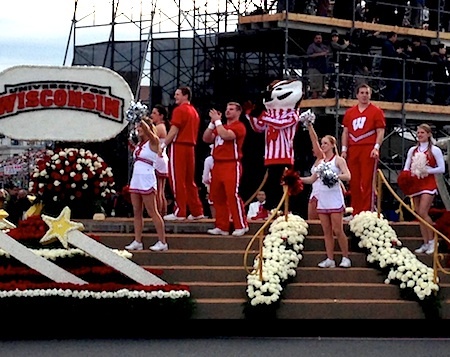 Of course, the Rose Parade leads up to the annual Rose Bowl Game, which this year features Wisconsin versus Stanford. 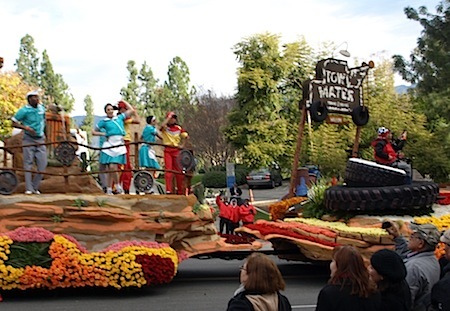 Remember, every surface of a Rose Parade float must be covered in flowers or other organic material. 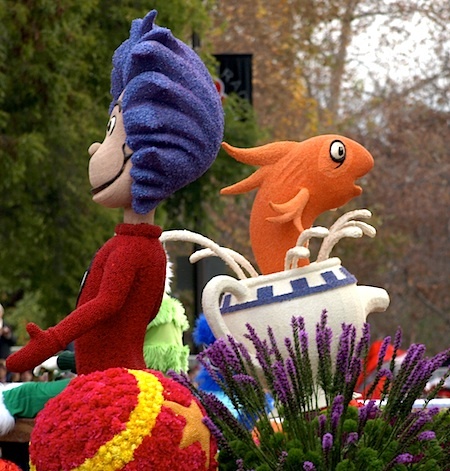 That creates a huge last-minute rush to decorate these floats, as participants need to ensure all that flora will be fresh on New Year's morning. 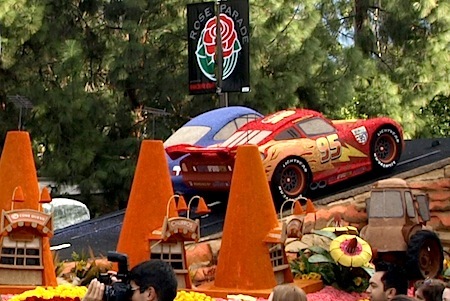 Here's what the crew from Cars Land was wearing (from the Tournament of Roses' press release): "[Lightning] McQueen will be covered in red carnation petals, strawflower and seaweed. Sally will be covered in cut statice, lunaria and clover seed. The tractors will be covered in a variety of seeds, mums, seaweed and black beans. The animated signs will be decorated in a variety of seeds, strawflowers, mums and marigolds. 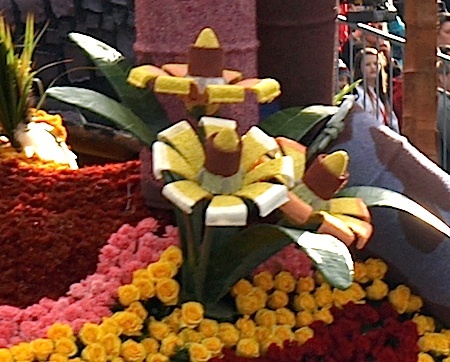 The mountains and rocks throughout the float will be covered in lentils, clover seed, mums and strawflowers. Throughout the deck of the float will be live pinon trees, cactus, succulents and a variety of grasses. 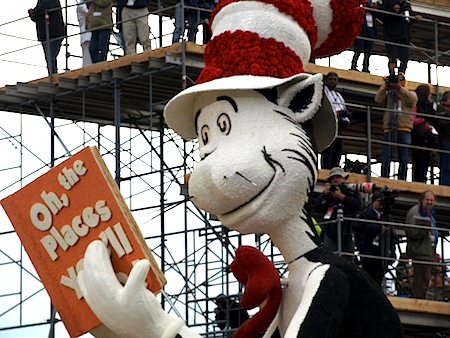 There will be thousands of roses, carnations and gerberas spread throughout the float." P.S. Disney's other big event today is the opening of entries for Disney's 2013 sweepstakes - one Disney vacation given away every day in January. 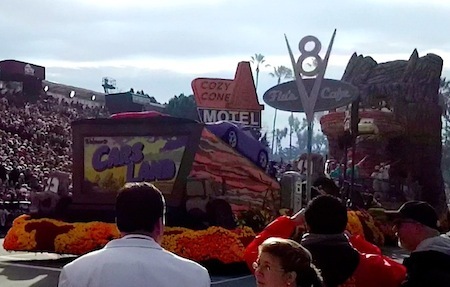 January 1, 2013 at 10:30 AM · Cars Land's float is really nice; Disney was able to recreate that land in a small space. The Mater part was a nice touch, but they are not able to move his mouth like they do for the ride. January 1, 2013 at 1:11 PM · Mater's just practicing his ventriloquism! January 2, 2013 at 7:40 AM · Thx Robert – I was looking forward to your report on this event..